A former journalist who helped throw off decades of communist rule, Mongolia's president Tsakhiagiin Elbegdorj has long dominated the political landscape but is now accused of failing to combat a wealth gap generated by a resources boom. Elbegdorj became president in 2009 after twice serving as premier, taking office on the back of his democratic pedigree in a country where many believe politics is tainted with corruption. He was a leading figure in Mongolia's peaceful 1990 revolution, an event which signalled a transition from 70 years under communism to a democracy which has been largely stable. Four years ago, the Harvard-educated Democratic Party candidate was voted in on a populist platform of ending graft and reversing a widening rich-poor gap in the nation of nearly three million people. But while Mongolia has seen the influx of huge sums of cash from foreign investors resulting in the rapid development of the country's tiny economy, much of the money has failed to trickle down to the poor. Elbegdorj's opponents in the 2013 election have used the "resource nationalism" card against the president, blaming him for inequality in a country where almost a third still live in poverty despite the historic mining bonanza. "My life has not changed a bit after Elbegdorj became president," said 68-year-old Ochirbat Dambayarimpil, who runs a convenience store in Ulan Bator. But the president is a symbol of democratic stability for many Mongolians, particularly the young and city-dwellers who do not share their elders' nostalgic view of the Mongolian People's Revolutionary Party (MPRP) and the Mongolian People's Party (MPP) who ruled the country before its democratic watershed. Sanj Bayar, former prime minister with the MPRP, blamed deadly riots which followed the 2008 parliamentary elections on Elbegdorj, the then leader of the Democratic Party group. He said 50-year-old Elbegdorj had triggered the unruly scenes by alleging electoral fraud and blaming the MPRP of harbouring designs of bringing back an autocratic system. The episode revealed Elbegdorj as a pugnacious political fighter, a reputation he has tried to cultivate more recently by investigating graft in the national airline and in attempting to confront foreign investors. In February he called for greater transparency from the foreign companies who run the huge $6.2 billion Oyu Tolgoi mine in partnership with the Mongolian government. 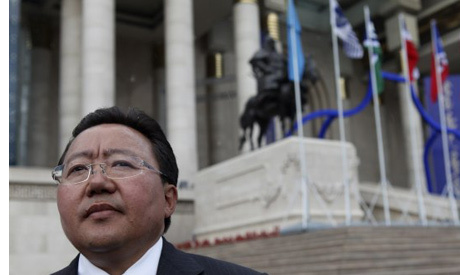 "Elbegdorj is a worldly Mongolian leader who has become more complex in his relationship with foreign investment," said Julian Dierkes, an associate professor at the Institute of Asian Research, University of British Colombia. "Rather than being generally hostile or friendly, he has raised specific concerns about foreign investments to evaluate the benefits such investments bring," the Mongolia expert told AFP. During his presidency, Elbegdorj's profile on the international stage has grown as he has forged closer links with Japan, the EU and the United States. Many observers believe this policy is aimed at cementing Elbegdorj's democratic credentials by distancing Mongolia from its two powerful neighbours -- Russia and China. "(Mongolia) has very striking differences from other countries close to us, in that we are open," he told AFP during last year's parliamentary elections.